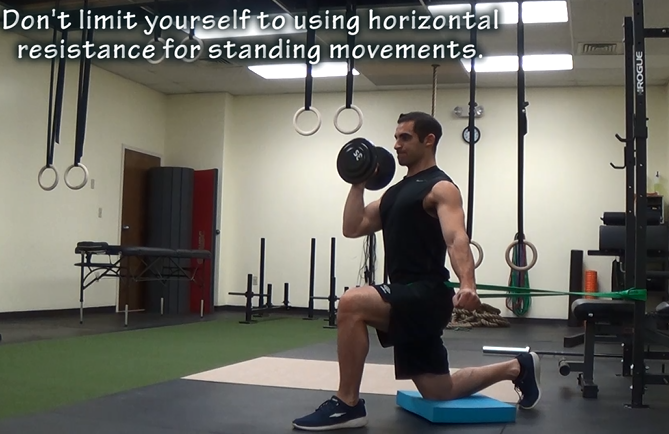 I’ve been using horizontal resistance with a variety of movements, and large range of clients for a while now. 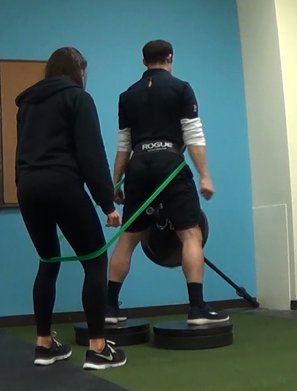 Over time it’s become a tool I use to not only teach people to create full body tension, but to help them fire the glutes with almost every exercise from lower to upper body. The added benefit is that most people say they can feel this hit their glutes harder than anything they have ever felt. 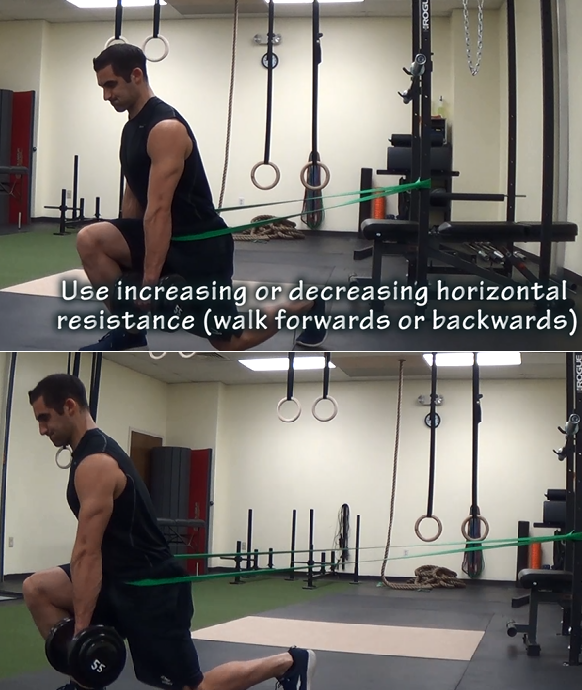 Just wrap a band, cable, or whatever else that provides resistance horizontally around your hip/hips and get after it. 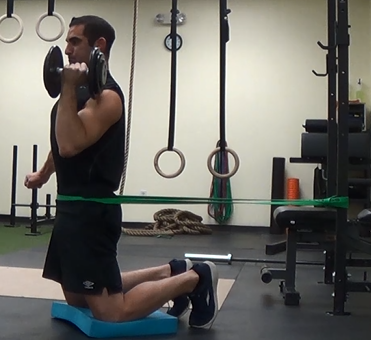 Unilateral horizontal resistance variations allow you to isolate one side if you can’t feel it working as hard when compared to the other. Just wrap the band around one thigh as demonstrated below. Holding onto something with single leg and/or arm exercises feels amazing. 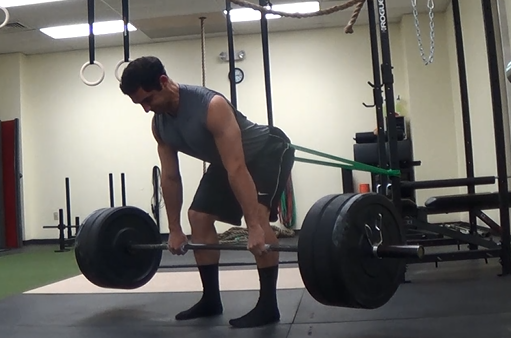 Below I am holding onto a prowler with my right hand. 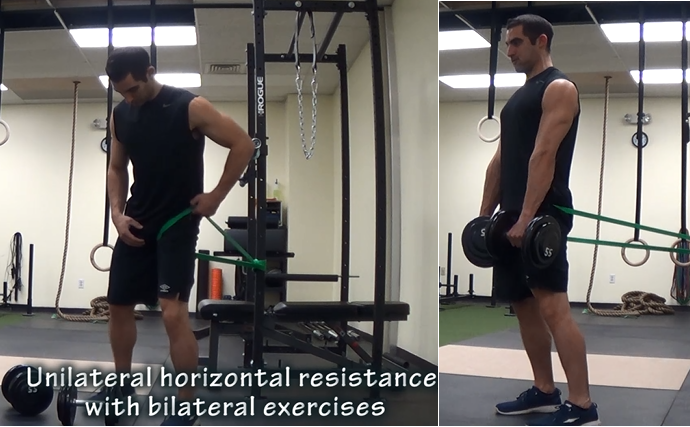 You can use more or less resistance by standing further or closer away from anchor point, using a stronger or lighter band, or adding more or less weight if using cables. Additionally, you can use increasing or decreasing resistance by moving forwards or backwards throughout the set. In the bottom picture below you can see I’m further away from the rack with each repetition. With bent over exercises (bent over rows, rear delt raises, etc. 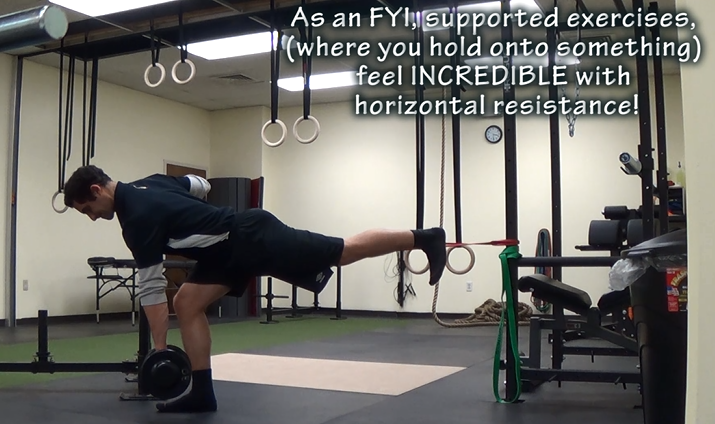 ), it makes it easier to hold a solid hip hinge position. In turn this allows most individuals to use more weight than they would normally. 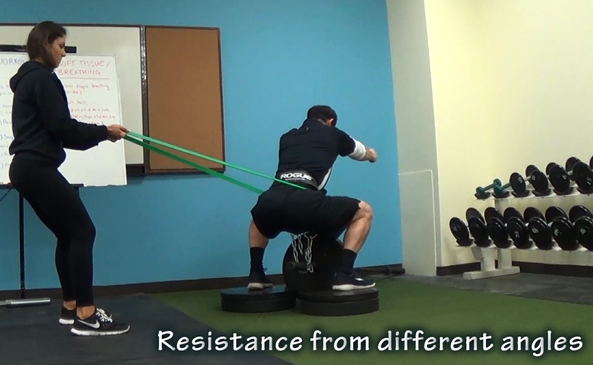 Use resistance from different angles, either to the side or up and down, or in between. Don’t forget about using positions other than standing either. Ground Rules: You can use this with almost any movement you wish. – 2 reps, 2 second hold at lockout. 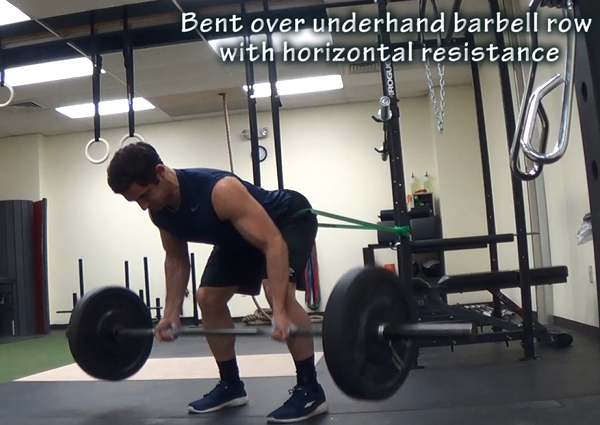 – 4 reps, 4 second hold at lockout. 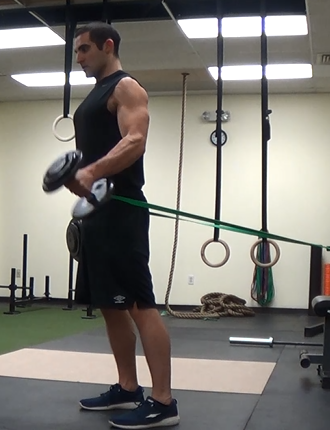 – 6 reps, 6 second hold at lockout. – 7 reps, 7 second hold at lockout. Thanks for reading! Please share this if you like it, or ask me any questions if desired.